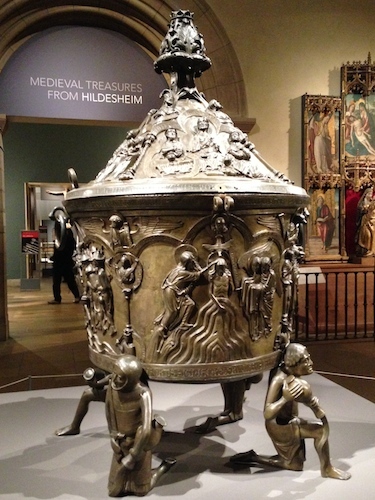 Before the Metropolitan Museum of Art takes down the Baroque Christmas tree, take a look at what’s sitting right behind it – a large, beautiful cast baptismal font that’s one of the treasures of a cathedral in Saxony that’s been transported to New York for the exhibition, Medieval Treasures from Hildesheim, closing January 5. Like the medieval hall surrounding you, it will take you back to the Middle Ages, along with the manuscripts, castings, croziers, and spectacular rock crystal ornaments in Gallery 521, a few steps away in the special exhibition space that you pass going toward the Lehman wing. During the holidays, the small space was packed with medieval-art lovers relishing the fact they were seeing treasures from a unique UNESCO World Heritage site right in the heart of Manhattan – the first time they have left Germany. While renovations were being done at Hildesheim Cathedral, 50 amazing treasures were sent here to give their spiritual heft to the Met’s already hefty medieval holdings. Check out our Flickr site for some of our favorites. The 1226 baptismal font is a true masterpiece of casting, along with the magnificent eagle that has sat upon a cathedral lectern since 1220. The Jesus figure of the Ringelheim Crucifix at the center of the exhibition is one of the most important (and awe inspiring) large-scale wood sculptures surviving from the post-1000 era in Europe. The chalices, reliquaries, croziers once held by medieval bishops, and bound books of the gospels and sacraments will stop you in your tracks. 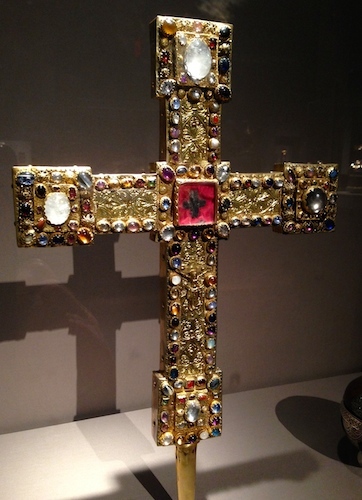 Seek out the bejeweled cross with what was once believed to be a relic of the True Cross. 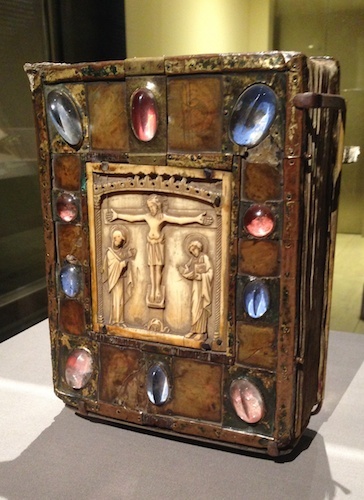 Many of these treasures, including the bogglingly beautiful Gospel Book, were commissioned by Bishop Bernward of Hildesheim (960-1022), whose aesthetic vision transformed the cathedral into the must-see pilgrimage spot that it remains today. One out-of-towner told us that they traveled to New York simply to see this show. See the baptismal font and the other works for yourself, and you’ll know why. This entry was posted in Art, History, Museums, Technology and tagged art, culture, history, museums, sculpture by mssusanb. Bookmark the permalink. Finally!!!! I saw this when visiting the tree!!! Quite wonderful!